N. Torii (originally Sekiguchi) Shinsuke. F.N. Ichibei. Go: Kiyonaga. 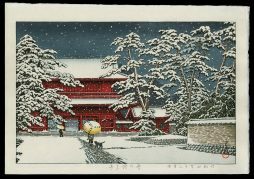 Ukiyo-e painter, printmaker. Born in Uraga, son of a bookseller and publisher. 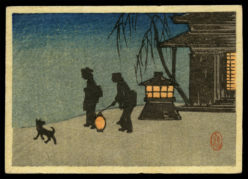 To Edo in 1765; became a pupil of Torii Kiyomitsu. On the death of his teacher, was adopted by the Torii family, inheriting the estate and becoming the last major member of the Torii school. From 1781 to 1788 the great ukiyo-e master; a tremendous influence on all artists of the last 15 years of the 18th century. It seems that about 1790 he gave up print designing but continued to paint. Great originality as a draftsman and colorist. An enormous number of prints, generally of bijin or stylish young men shown in the teahouses, shops, and streets of Edo but also of actors together with their accompanying artists such as musicians and chanters. His prints well designed, with calm, graceful figures; the carefully rendered details of the interiors give a good picture of late-18th-century Edo life. Considerable influence from Harunobu, Koryusai, and Shigenaga. Taken in whole, or in part from: Roberts, Laurance P. A Dictionary of Japanese Artists: Painting, Sculpture, Ceramics, Prints, Lacquer. Weatherhill, Inc: New York. 1986.